It started with a rough sketch, as many projects do. This multi-disciplined project spans technology from TIG welded steel frames and fabricated sheet metal components to custom made semiconductors used to detect and distinguish a range of x-ray energies. Headed by Professor Phil Butler of Canterbury University Department of Physics & Astronomy, the team comprises a range of talented individuals including design engineers, fabricators, precision machinists, electronics technicians, radiologists, physicists and software engineers. Various groups of students studying in these fields also contribute significantly, which has been one of the stated intentions of the project. 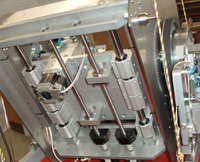 The core of the machine is the Medipix semi-conductor detector. This has been conceived and developed at CERN (European Organisation for Nuclear Research) as a spin-off of the detector technology used in the Large Hadron Collider (LHC). This is a constantly evolving technology. 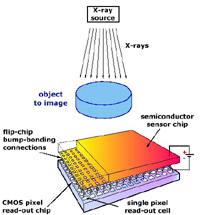 Although tiny, this device has taken many years and many collaborations to develop into the current Medipix 3 detector. 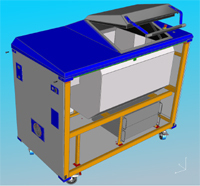 Quarticom's contribution to the project was to design and assemble a rolling cabinet to contain and operate the already constructed rotary gantry assembly. The gantry aims and aligns the X-ray tube and camera assembly, so that it rotates and scans around a small stationary target. The maximum target sample size is approximately 100mm (4 inches) diameter by 280mm (11 inches) length. The cabinet had to also house the associated electronic control gear and interface computers. Just to keep things interesting, the gantry section had to be completely enclosed by a secondary radiation shield of 2mm thick lead sheet. In order to be able to install, access and remove the gantry assembly, the shielding was required to split into separate tank and lid sections, whilst still safely stopping secondary internal x-ray radiation leakages once in operation. The shielding constraint affected the design mostly by restricting mechanical communication with the gantry. Fixtures and cable routes had to take the long way through a radiation blocking labyrinth. Also, the degree of precision required was higher that most fabricators tend to work to. Luckily we found a local fabricator willing to adapt, and they proved to be great partners for our project. My role expanded to include some machining, as a guest contractor in the Physics workshop. This enabled us to try out ideas to improve various fittings and assembly methods that were more obvious on the final assembly. With a resulting quicker turnaround, this has helped improve the overall design and usability of the machine, from a technician and operator point of view. Consulting with the various suppliers has also proved invaluable, as we have channelled their advice on how to make it easier to manufacture straight back into the design record. This project has been very satifying and enjoyable for me. It has called upon most of my skills and experience, ranging from project management, design, machining and fitting. As a bonus, I get to work and interact with a diverse range of talented individuals at the university and with suppliers. It is a priviledge to be able to work in the physics workshop, where I can still enjoy hands-on machining. Along with the license to come up with creative solutions to quickly head off time consuming delays, I feel it is my diversity which has made the main difference to Quarticom's contribution. There are five of these machines already completed and on their way to various rearch institutes in Europe and the USA. We are already looking to the next run of machines, with an eye to improve upon what we have learned from the first batch of machines.